As it turned out, the SEC saw a great deal worth preserving in the New York Stock Exchange and the regional stock exchanges. From its start in 1934, and for almost four decades after, the SEC usually was willing to let SROs take the lead in supervising their members and regulating market activity. After several crises and uncorrected market abuses, the SEC sought from Congress enhanced powers of supervision over the SROs themselves. Congress obliged with the Securities Acts Amendments of 1975. 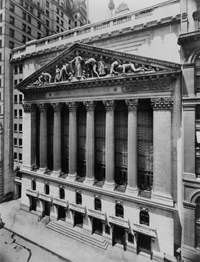 By then, no one any longer claimed that the NYSE was perfect. (23.) April 12, 1934 Letter from Richard Whitney, New York Stock Exchange, to President Roosevelt requesting meeting on "unsound" securities legislation ; Brooks, Once in Golconda, 198.